My side project for the last month is to try and collect the Curriculum Vitae of everyone standing for Parliament. It’s called Democracy Club CVs. It’s also just enjoyable, with leaflets from ex-whips, professional musicians and raving loony leaders (that last one is standing against Boris). But that doesn’t really explain … why am I doing it? 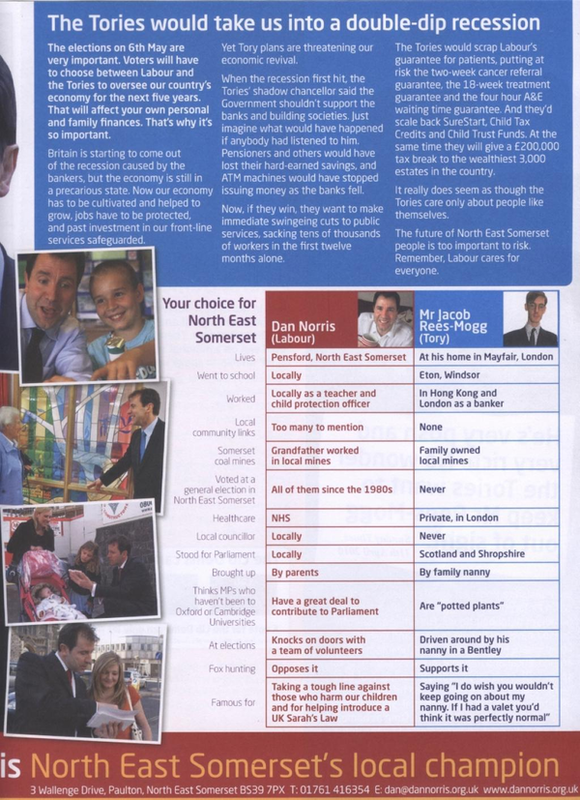 The idea for the site came from this election leaflet Julian found in the 2010 election (Guardian article). It has a kind of CV written by Jacob Rees-Mogg’s opponent. Take a look. I don’t have a fixed idea of what background makes a good MP. I do, however, like the idea (thanks James) that their background should be representative of their constituents. Hopefully, when we have enough CVs, academics linked to Democracy Club can start doing this kind of analysis. Aine, one of the directors at ScraperWiki, really likes CVs. It’s not that they’re magical things that tell you everything you need to know about a job applicant. Why is it? Firstly, the form of the CV tells you quite a bit. Is it clearly laid out, easy to read, spelt correctly? Is it evidently a CV they’ve used to apply for other jobs recently, or have they never had to apply for a job and it is just their political bio recanned? It’s not just me that thinks this matters – we ran some user testing with unconnected members of the public, and it was the main thing they judged the CVs on. To try and encourage good formats, we added this to the upload page. In later desperation, I also gave a link to the National Careers Service advice on writing a CV. Secondly, the content gives some indication of skills. Would our Prime Ministers like a better talent pool to pick ministers from? Would it increase quality in the way the country is run? I don’t know! But it wouldn’t hurt to try! You can pick a maths teacher, a mental capacity lawyer, a manufacturing engineer, an expert in changing complex organisations, a carbon capture lead… And that’s just from the few CVs we have in already. 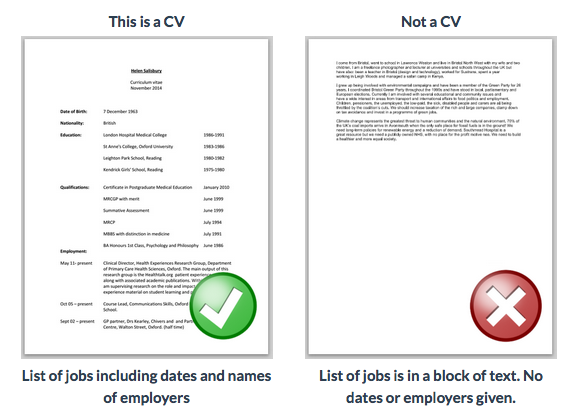 With a CV the details tell you lots – the exact list of places and names of companies, whether there are gaps. The progression in job titles. It’s all that detail which you can pattern match on, in a way that you can’t for a short bio. There’s plenty of talent out there. I think it is part of our job as voters / recruiters to select for talent. It’s outrageous to complain the country is badly run, if we don’t even do basic due diligence in selecting good people to run it. Of course, the CV isn’t the be all and end all. It is a minimum. It’s the least possible thing we could look at. We, as voters, are interviewing candidates for the £67k job of creating all our laws, and directly running the administration of half our economy. Yet we don’t routinely do what every employer does for even the lowliest job. If you’ve read this far, I’d love it if you’d help us get more CVs! It’ll only take a couple of minutes. Go to http://cv.democracyclub.org.uk/, put in your postcode, then email and/or tweet all your candidates to ask them to upload your CV. P.S. My CV has been public and on my website since the 1990s. I have never stood for Parliament. It’d be good to talk to you about this. Please drop me an email. There are several strange decisions from DG JUST. The EU Commission rejected.